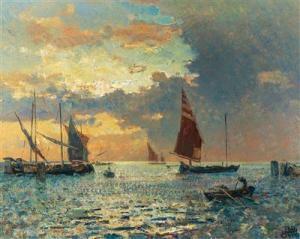 Find artworks, auction results, sale prices and pictures of Giuseppe Ciardi at auctions worldwide. Good untouched condition, rather dirty with discoloured varnish and fine craquelure throughout, signed lower left, in its original moulded gilt frame which is in fair order, Continental labels verso, purely printed with numbers, no inscriptions. 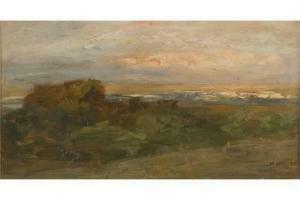 Signature contemporary to work and picture is believed to be by Beppe Ciardi. No further authentication to establish this. 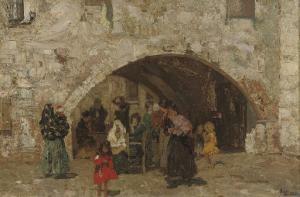 Ciardi came from a family of artists. His sister Emma is a well-known Venetian painter, and together with Beppe the two siblings began their education with their father Guglielmo. Beppe continued his training at the Venice Accademia under the guidance of Ettore Tito. 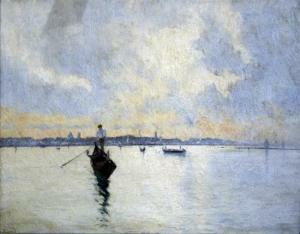 He focused his attention on capturing the effects of light and everyday life in the Venetian lagoon. Having achieved international success throughout his career, in 1912 the Venice Biennale dedicated an entire room to Ciardi. Today his works can be found at the Luxembourg Museum in Paris, the Ricci-Oddi Gallery and at the Museums of Modern Art of Rome and Venice.